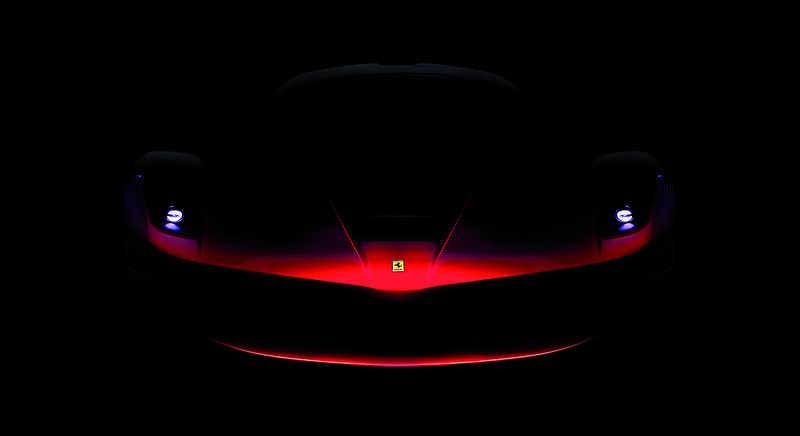 Maranello, January 2013 – Now available on-line on the official Ferrari web site are the first teaser images of the new special limited series hybrid supercar which is due to debut later this year. The two images of the car accompany an interview by The Official Ferrari Magazine with Roberto Fedeli, Technical Director, and Flavio Manzoni, Head of the Styling Centre In the article they discuss the importance of the legacy of Ferrari’s previous special limited series models – the GTO, the F40, F50 and Enzo Ferrari – and the company’s approach today to transferring Formula 1 technology and innovations to its road cars. A working group of F1 and GT engineers has been focused on the chassis for more than three years, availing itself of the contribution of Rory Byrne, who helped win 11 world titles in his role as the Scuderia’s Chief Designer. To achieve maximum efficiency and minimum weight, the carbon-fibre monocoque will be built in-house in Ferrari’s F1 composites department using materials, design methodologies, construction processes and instruments used to produce the single-seaters. Key to the chassis performance characteristics is the use of four different types of carbon-fibre which are hand-laminated then cured in autoclaves following engineering processes which optimise the design by integrating the different components. The result is torsional rigidity has increased by 27 per cent and beam stiffness by 22 per cent compared to the Enzo Ferrari. The space beneath the bodywork has been cleverly utilised in order to house the complex mechanical units and to perfect the internal fluid dynamics. The positioning of the batteries and fuel tank assembly is key to this – just like on an F1 car, they are located in the safest, most protected part of the car and are set very low, just behind the driver’s back, to reduce the overall centre of gravity. This was one of the key targets for the new car, along with a reduction in height and wheelbase to match that of the 458 Italia, despite featuring a V12 HY-KERS engine and dual-clutch gearbox. In order to rationalize interior space, the cockpit, and consequently the entire vehicle, is built around the driver, making the most of Ferrari’s experience, both in functionality and ergonomics. Hence the decision to adopt a fixed seat, which will be made to measure (as it is in an F1 car), with an adjustable pedal box and steering wheel. The inclination of the backrest, and the fact that the occupant’s feet are at the same level as the driving position, gives an extraordinarily racy feeling and achieves a considerably lower center of gravity. The Special Limited Series will be powered by a development of the 740 CV 6.3-litre V12 introduced in the new F12berlinetta, along with the latest evolution of Ferrari’s HY-KERS electric hybrid system unveiled at the Geneva Show in 2010. The HY-KERS system is a performance enhancer, as well as a tool in the battle to lower emissions. In fact, it is estimated that that the system shaves 10 per cent off the car’s 0-200 km/h time, while cutting emissions by an impressive 40 per cent, while also enhancing a torque vectoring system, traction control and brake force distribution as it is fully integrated with Ferrari’s already phenomenal chassis electronics. Under braking, the KERS directs the kinetic energy to charge the batteries. The choice of battery size and weight is a fundamental factor in this type of technology. The amount of electric power that can be used, and how it is used on a car with these characteristics, are decisions that are made with an eye to performance, given the car’s natural vocation. However, a balance must be struck between the requirement for a battery that is not too heavy and the need for the supply of sufficient energy required for electric propulsion. The electric motor/ancillaries/battery unit has a weight-to-power ratio of one, a figure in line with F1 in terms of efficiency, thus further improving the car’s overall weight-to-power ratio.